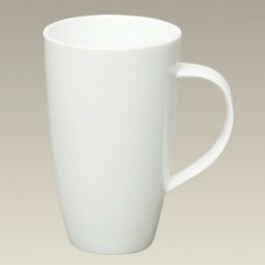 This porcelain mug features a sleek, modern design. At 20 ounces, it is a great size for any coffee addict. It is 6" high and 3 5/8" wide. Dishwasher and microwave safe. Made in China. This item is a SELECTED SECOND. It contains slight imperfections. All sales final. Scalloped Shape Night Light, 4.25"